A stroll through Indie MEGABOOTH at PAX East 2014 would not have been complete without a visit to Klei to check out Invisible Inc. You may know Klei from their previous high-quality titles including Mark of the Ninja and Don’t Starve (expanding soon). Going into the convention, Invisible Inc. was high on my list of things that I planned to see, and I was not disappointed. 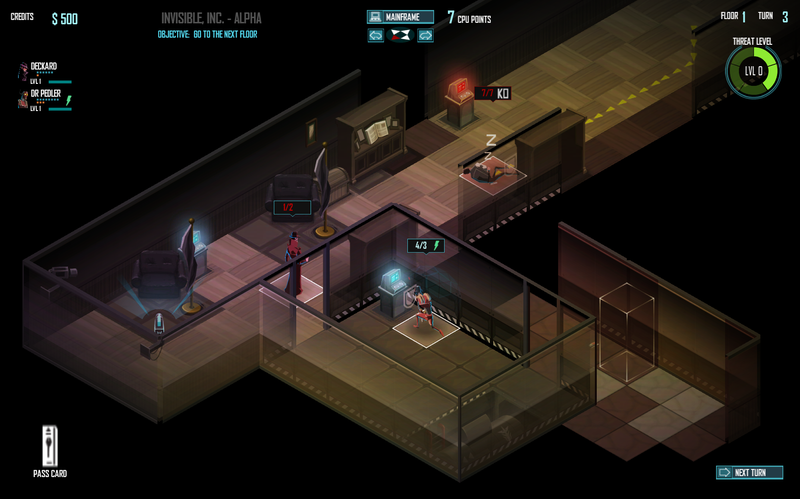 Invisible Inc. is a retro-espionage themed turn-based strategy game, which places more of an emphasis on stealth than it does combat. Fans of 3rd person stealth titles, as well as turn-based strategy games, will find a lot to love here. The game is currently in alpha, but it already has many of the elements you would hope to see, given Klei’s track-record and the description above: Secret agents? check, swanky spy-music? check, crisp looking art? check, a rich-tactical experience? check. I am admittedly a sucker for games that dabble in the retro-future, though unabashedly so. I totally geeked out, then, when developer Jason Dreger described the thematic style as “what if the ’60s had been carried into a cyberpunk future?” It’s a question I ponder, every day. Let’s talk gameplay. In the build we played on the show floor (in addition to the early-access Alpha build I played immediately upon returning home) , I found myself learning how to break into a facility, avoid and neutralize guards, defeat security measures, and hack the planet (as the kids say). Admittedly, I was terrible at the expo demo, but the Alpha’s tutorial had me sneaking around with ease in no time. There are a couple of things about gameplay Invisible Inc. that immediately stand out: the first things is that your characters are clever, but not superhuman. Staying out of trouble is the key to success in this game, and more often than not you’ll enter a map without a weapon. I found a dart gun that shot tranquilizer rounds in one of the maps, which was more than equal to the task, at-hand. After all, killing people requires someone to come clean up the mess, so knocking them out is the way to go. There’s something highly satisfying about sneaking up behind an enemy to administer a stern judo-chop to knock them out. The game also boasts a really cool hacking mechanic. Your agents can hijack enemy technology (Computer consoles, etc.) in order to earn CPU points. Clicking the Mainframe button on the UI convers the isometric-view into a cyber-grid, where CPU points are spent in order to disable enemy barriers, unlock vaults, and other tom-foolery. 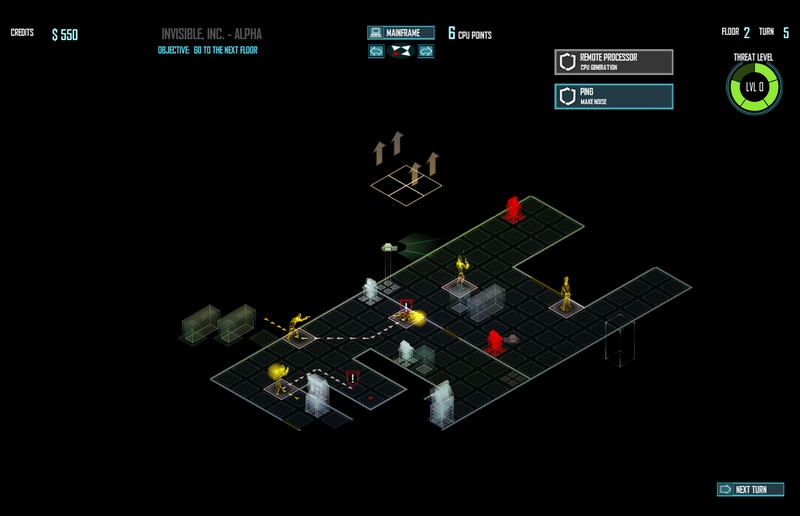 If you’ve played Shadowrun Returns or Gunpoint, Invisible Inc.’s mainframe interface is right there, in the pocket. Even in this early stage of development Invisible Inc. also borrows some great elements of traditional 3rd person action stealth games. Character can peek around corners and through doors, great for revealing the map, avoiding enemy contact, and identifying objects to hack into. 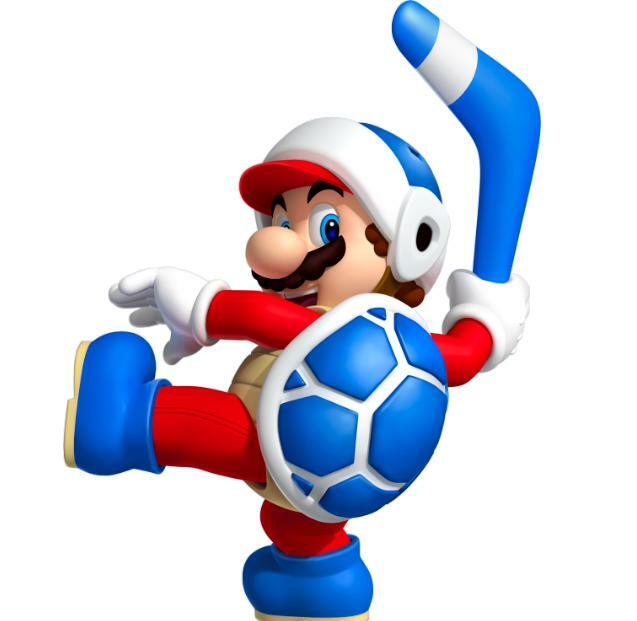 The character I started with also has a light-step, but other agents make noise when they move, which means you do not need to be seen to be detected. There is also a mechanic in the game that predicts the path a known enemy might take… although it might not pan out that way. Strategy is the name of the game here, and it will only get better as the game moves into beta, and an eventual full release. Want to help shape the development of the game and track its progress? You can get into the alpha now via humble-widget on the Invisible Inc. homepage, a deal that will net you two access codes (for you and a friend) as well as the game’s soundtrack (when finialized). 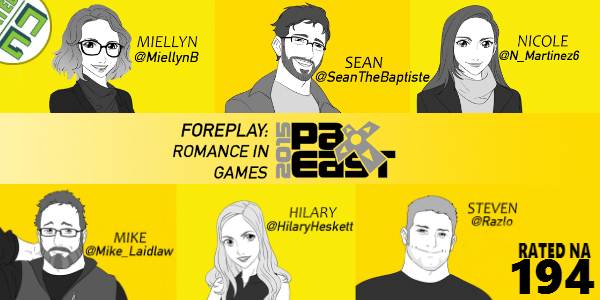 Explore love, lust, and choice in games in a lively discussion with moderator and Let’s Quip creator, Sean Baptiste, Dragon Age Creative Director, Mike Laidlaw, The Wolf Among Us and Game of Thrones writer, Nicole Martinez, Billionaire Banshee creator, Steven “Razlo” Bailey, Strange Loves videogame series writer/producer, Miellyn Fitzwater Barrows, Dragon Age and Mass Effect Global Product Manager, Hilary Heskett Shapiro and special surprise guest Dragon Age and Mass Effect writer Patrick Weekes! 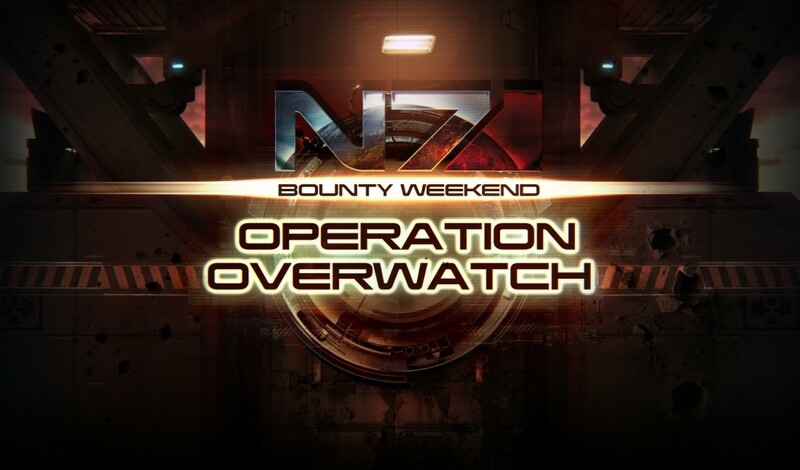 The Mass Effect 3 bi-monthly challenges continue this weekend with Operation Overwatch. Unlike July’s Operation Broadside, Overwatch appears as though it should be easier goal to accomplish. Simply extract your team on any difficulty with one of the new N7 classes, and you’re all set. The allied goal is a combined extraction of 800,000 individual players on any difficulty level… even bronze. NEW: We checked out the awesome retro-stealth-espionage of @Klei ‘s Invisible Inc at #PAXEast — http://t.co/Bv0rBChNUD and you should too!